Even though you’ve probably finished watching Netflix’s second season of Queer Eye, it’s proving to be a gift that keeps on giving. As you’ll remember from the newest season, one of the contestants, William, proposed to his girlfriend Shannan on the show. Now, William and Shannan from Queer Eye are married, and it looks like they used some of the Fab Five’s guidance for their wedding. As any QE fan knows, Tan France, the show’s style expert, tends to nudge makeover subjects toward adding printed shirts to their wardrobes. Can’t you just hear him telling his makeover recipient to have more fun and show off their personality with their clothes? Well, both William and Shannan did just that for their wedding. 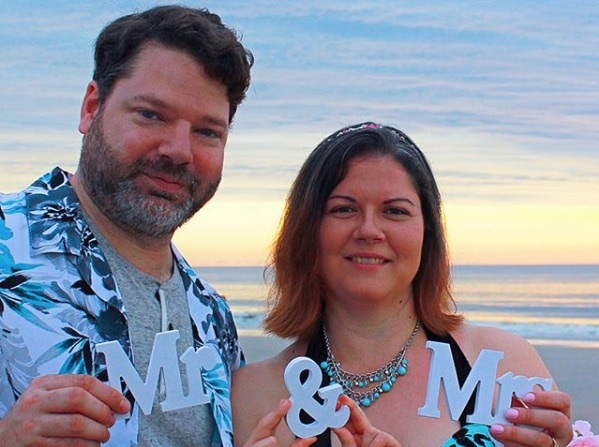 Photos posted from the sweet beach ceremony show that both the bride and groom wore blue Hawaiian prints — a shirt for William and a dress for Shannan. If only we could watch the Fab Five while they watched footage from the wedding. It would be a total cry-fest, and Jonathan Van Ness would have the best one-liners. Oh, henny! While we didn’t get to witness the Fab Five sitting on the couch together and watching William and Shannan exchange vows, they did share a sweet message on social media. “Congratulations William and Shannan! Thank you for letting us be a part of your love story and we hope that the next phase of your life is filled with love, movies, and a lot of avocado goddess! We Shannan you both,” they wrote on Instagram, complete with heart emojis. Even a masterful interior designer like Bobby Berk couldn’t have made a better setting. As you’ll remember from their Queer Eye episode, William chose the word “Shannan” to mean “more than love,” because that’s how he felt about her. Then, with the help of Karamo Brown, William made a short film for his proposal. It was a rom-com — Shannan’s favorite! To her great surprise, William showed the film at an outdoor screening, then popped the question in front of a large crowd of people. William’s proposal video is totally worth a re-watch now. It was incredibly sweet, and made even sweeter by the Fab Five’s commentary about how “gorgeous” they were. But maybe the best part is Tan’s reaction to their wedding. "I COULDN’T BE HAPPIER FOR THEM. SOME OF THE BEST PEOPLE I’VE HAD THE PLEASURE OF MEETING," he commented on their wedding photos. William also announced the wedding, which actually happened on June 16th, on his Twitter account. “I married my best friend Shannan,” he wrote. Um, major tear-fest, party of one. We can’t wait to see which Queer Eye makeover-ee marries their soulmate next. Hopefully, they’ll all wear Tan’s famous printed shirts for the occasion — and maybe even give them a French tuck, too.